Any hints for controlling digitakt with pyramid? i can put a prog change message on every single step of a track on the pyramid, but the digitakt will not change patterns. any geniuses in here? how do you control your digitakt? what’s your workflow? do you manually change patterns on the digitakt? i have midi set up properly. i have tried multiple CH.LEN settings on the digitakt to no avail. digitakt doesn’t need bank changes, only program changes. curious how i actually control program changes without stopping the digitakt. accepting any and all hints for controlling digitakt with pyramid. if i can’t do this, then any hot tips for controlling pyramid with the digitakt? I have both, but I’ve only had the Pyramid a few days, I’m still figuring a lot of stuff out. Separate channels is doable, that’s how mine’s set up right now. Unfortunately using definitions for each channel eats up your 16 slots quick, so that’s something to be aware of. I have to experiment with program changes, it’s one of the reasons I got the pyramid in the first place, so I hope it does work one way or another, however, the level of control on the Pyramid has me re-thinking a lot of my current set up, so who knows how it will work once i have it all figured out in my head. What issue are you having with separating out the tracks? iirc the setup is pretty straightforward, the channels are already mapped 1-8 in the Digitakt. I’ll start experimenting with program changes now and see what I can get to happen as well. I suspect PC will have to be sent on a separate channel to the main 8 midi tracks, possibly on whatever channel is set to Prog Chg In on the Digitakt. e: Program Change works - as I suspected, needs to be sent on the Digitakt’s control channel - I think it’s 9 or 10 by default, I have it set to 16. I used the step mode to do a simple CC automation step and changed the Program Change CC value, Digitakt changed program at the end of the bar as expected. 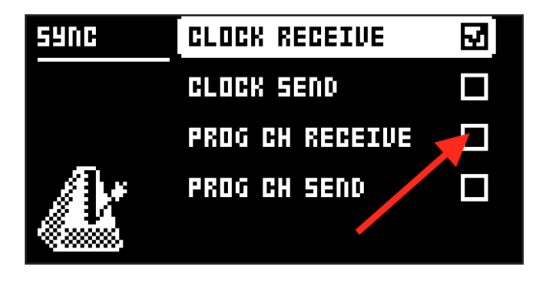 Make sure PRG CHG RECEIVE is also set in the midi Sync menu on the DT. it’s cool. it’s hard to find hints controlling this thing. hope people find useful info from this thread. so i figured out how to program change. squidgyb is right. but it’s unreliable for me. it will change on time some of the time. it’s mostly fine, but too unreliable to use in a live setting. doesn’t matter if i change the CH.LEN to 2 or off, or put it on the first step of a bar. In Track Mode - Use one of your tracks set to Midi Channel 14 for the PC, I typically set the length to the length of my Digitakt patterns which is usually 4 or 64/64. 2d. 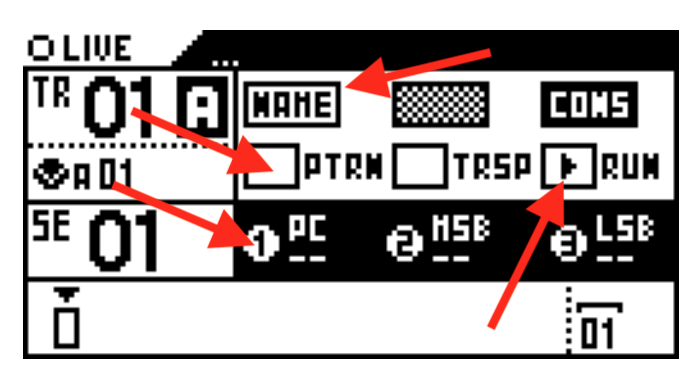 Use encoder knob 1 to set the PC change on the DIGI, 1 = A1, 2 = A2, etc, you should see the Digitakt change patterns when you do this bc it will be accepting PC messages now. Has any seen how the tuna guy and the film editor gal figured out how to send midi to the pyrimad from the various synths? I know there is Omni mode (or is it multi track) that makes it possible, I think they used thru boxes back and forth.